Born in Florence, Andrea di Michele di Francesco de’ Cioni worked a series of odd jobs at a young age, including tile and brick maker, even as tax collector. His diverse talents were no less as an artist, having been noted as a painter, goldsmith, perspectivist, draughtsman, sculptor, carver and musician. Though there is much unknown and undocumented about this influential artist, having only one signed painting to his name. If he was all that is written about him, or even if perhaps he may have been more is of much historical speculation. It was not until he trained as a goldsmith with Giuliano Verrocchi, that Andrea took the surname of Verrocchio. His artistic presence became known after his rise under the patronage of the Medici Court in Florence. This was not until after 1466 when the prized artist of the Medici’s, Donatello past away. It is even rumored that Verrocchio was an apprentice under Donatello, though his earliest training in painting is said to have not begun until the 1460s in Prato in Tuscany with Filippo Lippi (1406 – 1469) or another Florentine artist Alesso Baldovinetti. His first painted work may have been with Lippi, working alongside Sandro Botticelli (1444 – 1510) in a series of murals for a cathedral in Prato. Throughout 1465 – 1467 he did sculptural pieces including monuments for Cosimo de’ Medici and then again in 1472 for Piero and Giovanni de’ Medici in the Old Sacristy Church in San Lorenzo. Piero de’ Medici and his son Lorenzo where great supporters of Verrocchio and the artist was made the court’s curator for its collection of Roman antiquities. He also designed costumes and armor for some of the festivals, tournaments and receptions in the Medici court. Verrocchio was also commissioned by the Venetian State and the City Council of Pistoia. Working as a bronze sculptor, Verrocchio was commissioned by the Tribunale di Mercanzia (or Florence Guild of Traders) to do a group of pieces, titled Christ and St. Thomas for the Church of Orsanmichele. These works replaced Donatello’s St. Louis of Toulouse, in the church’s exterior. A candelabra he made in 1468 for Florence’s town hall is now on display in Amsterdam. A teacher of many great students, Verrocchio had under his tutelage, Pietro Perugino (1446 – 1524), Domenico Ghirlandaio (1449 – 1494), Sandro Botticelli and his most famous pupil, Leonardo da Vinci. 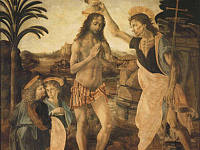 The famous piece, Baptism of Christ, was completed between 1474 – 1475 by Verrocchio and his then student Leonardo da Vinci. 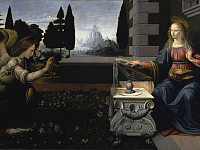 In the painting, Leonardo completed the background and one of the angels, of which the superior quality startled Verrocchio so that he professed to never touch a brush again. Though around this same time Verrocchio’s only attributed painting, Madonna and Child with Saints, (1475 – 1483), was completed with another of his students, Lorenzo di Credi in the Cathedral of Pistoia. There are other possible paintings created by Verrocchio, but his work turned mostly to sculpture in his later years, and his total artistry is said to have been best in the last two decades of his life. His most ambitious work, an equestrian statue of Bartolomeo Colleoni, was left unfinished at his death and completed by Alessandro Leopardi, but Verrocchio’s design was truly innovative for the time.